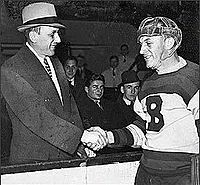 Irvine Wallace "Ace" Bailey (July 3, 1903 – April 7, 1992) was a Canadian professional ice hockey right winger. He played a career total of 7 seasons in the National Hockey League (NHL). He played for the Toronto St. Patricks/Toronto Maple Leafs organization. In the beginning of his 8th season with the team, he had his career ended. Before playing in the NHL, Bailey played 2 seasons of senior hockey with Peterborough. He was signed by the Toronto St. Patricks in November 1926. During his first season with the team, they changed their named to the Toronto Maple Leafs. In the 1928–29 NHL season, Bailey became the league leading goal scorer, scoring 22 goals and 32 points in 44 games. He once again became the Maple Leafs' leading scorer in the 1929–30 season and he was one point short of repeating as leading scorer in the 1930–31 season. His offensive production declined in the 1931–32 season but he was still able to help Toronto win the Stanley Cup in 1932. On December 13, 1933, during a game between the Maple Leafs and the Boston Bruins, Bailey was hit from behind by Eddie Shore of Bruins and hit his head on the ice, fracturing his skull. Bailey had severely injured head and it was feared that he would not survive. Bailey would eventually recover from his injury but he was never able to play hockey again. There was an all-star benefit game that was held at Maple Leaf Gardens on February 14, 1934, which raised $20,909.40 for both Bailey and his family. Bailey and Shore shook hands and embraced at centre ice before the start of the game. The NHL introduced the annual all-star game thirteen years later. Ace Bailey Facts for Kids. Kiddle Encyclopedia.